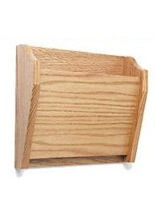 Titles are Visible With Tiered Design! 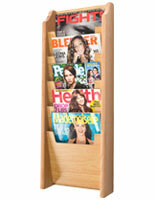 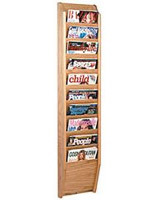 This 4 pocket light oak flyer rack keeps titles of contents visible by design! 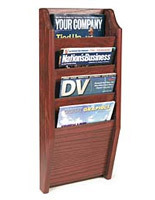 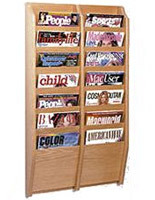 This literature stands system has a unique slanted construction that will ensure prospective customers, patients, and visitors will notice the reading material! 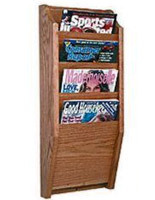 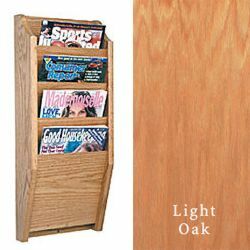 This 4 pocket light oak flyer rack, also known as a catalog holder, can be purchased with same-day shipping when in stock - just inquire upon ordering! 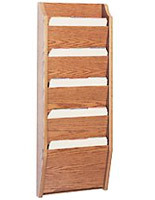 This wooden fixture is perfect for a retail store, office, or lobby environment. 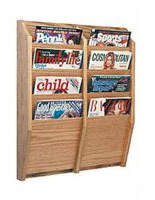 Each of these 4 pocket light oak flyer racks, such as a business paper sorter, fits four groupings of letter-sized periodicals.